Jerilyn Stowe is currently the Vice President of Marketing and Communications for United Way of Salt Lake. She provides creative leadership and vision for United Way of Salt Lake’s communication strategies in order to advance the mission and organizational objectives. Jerilyn develops and implements local brand strategies to increase visibility of the organization and create a positive brand experience for United Way’s stakeholders and the broader community. 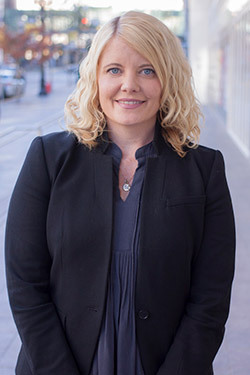 Prior to joining United Way in 2004, Jerilyn worked as Public Relations Manager for the Utah State Office of Education and spent three years in Washington, DC working as the Press Assistant to US Senator Bob Bennett. Jerilyn has also worked as a political and government reporter for the Salt Lake Tribune and an account manager at a local public relations firm. Jerilyn graduated from the University of Utah with a Bachelor of Arts in Political Science. She received her master’s degree in Professional Communications and Creative Writing from Westminster College in 2004. When not working, Jerilyn likes spending time outdoors with her husband Chris and their adorable daughters Molly and Lucy.